David Dalglish’s Skyborn was perhaps one of the greatest surprises for me last year. I didn’t know what to expect going in, but it turned out to be an epic start to a high-flying fantasy adventure series about a group of elite winged soldiers with the power to command the elements. The Seraphim, as they are called, are the warriors of a post-apocalyptic world in which humanity has taken to the skies. Everyone now lives on one of six floating island kingdoms that are constantly in conflict. The first book introduced us to protagonists Bree and Kael, twins who are following in their late parents’ footsteps by training to become Seraphim themselves. Much of Skyborn read like a “magic school” story, chronicling the siblings’ individual trials at the Seraphim Academy. In contrast, the themes surrounding Fireborn are a little more complex. This sequel is set right after the stunning events of the previous novel, and if you haven’t read Skyborn yet, I’m not going to ruin it for you. It’s enough to know that things have gotten very bad. In the fallout, one of the main casualties was the Seraphim order. With their home invaded and their order disbanded, Bree and Kael’s futures are now uncertain. However, upon their return to their occupied island, they are almost immediately recruited by a group of rebels planning to fight back against the powerful Center. Bree becomes their reluctant symbol, the Phoenix—a nickname given to her because of the burning twin blades she wields in battle. Meanwhile Kael, whose talents lie elsewhere, is tasked to recruit new allies for their uprising, but the coming war weigh heavy on his heart. As the fighting intensifies, he worries for his sister who is on the frontlines but also starts to have doubts about the leader of their rebellion, the unsettling cult leader and doomsday prophet Johan. As with the first book, there were some issues with the pacing in Fireborn. Despite its more intricate ideas, I also found it harder to throw myself into the plot or feel engaged with the characters. For the first half, this is essentially the standard dystopian-rebellion story, complete with member recruitment and secret gatherings. Some of these sections were a little too drawn out for my tastes, making this one a slow burner. Don’t get me wrong, though; this was still a solid sequel. However, it didn’t quite sweep me off my feet the way Skyborn did, containing some of the vexing symptoms of “middle book syndrome”. To be fair, the first book had the advantage of being a series opener, introducing readers to a fresh and unique world. That book charmed my socks off, understandably making it a tough act to follow. Fireborn makes up for its more subdued intro with a ton of action packed into its second half though. Again, like Skyborn, this book is back loaded with much of the excitement saved for the end when all the tensions finally come to a head. That’s when all the build-up starts to pay off. As the rebellion explodes into the open, Dalglish exacerbates an already fiery situation by throwing in an unexpected twist, adding an even greater threat to the equation. The aerial battle scenes continue to be a highlight as well, and their even better now that Bree and Kael have a much better handle on their flight skills and elemental powers. Fireborn wasn’t without its flaws, but then again, the first book also started on shaky ground before ending up blowing me away. Still, there’s no denying that it lacked some of the magic that made Skyborn so amazing. The story and characters may have matured while the themes have also grown darker, deeper, and more complex, but the plot itself remained rather simple and straightforward. 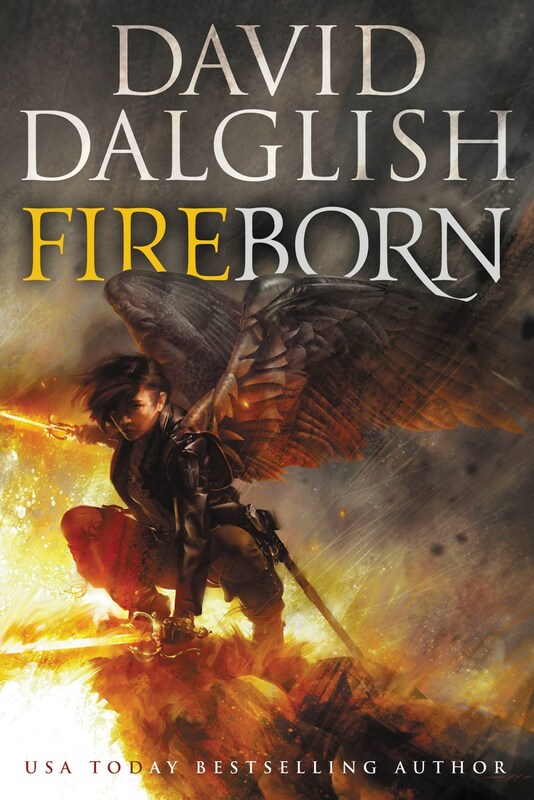 That said, I still really enjoyed Fireborn and in no way do I consider it a poor sequel. The ending did a fantastic job building up anticipation for the final book of the trilogy, and I’m looking forward to see how it will all end. Audiobook Comments: The Seraphim is another example of a series where I decided to jump formats again this year, choosing the audio edition over the print because I got curious after hearing such great things about the narration. I was not disappointed. Joe Knezevich is a fine narrator and he does some great voicework, playing with accents, inflections, and tones—though I think he could have taken advantage of even more opportunities to do so. Overall I have no complaints about the audiobook. If presented with the opportunity to continue the next installment in this format, I probably would take it. Recommended. ← Book Review: Winter Halo by Keri Arthur + Series Giveaway! Before this series, I’ve only read one book by him – A Dance of Cloaks, I think it was? I didn’t continue after that, it just didn’t appeal to me as much. Skyborn was really good though, I don’t think it was as dark either! Was it the Shadowdance series? That’s the one I tried too, and it didn’t really work for me. Glad I tried this series though, because it’s awesome. I have yet to read a book by David Dalglish despite owning several (sigh) and I haven’t hear any of Joe Knezevich’s narration either. Apparently Knezevich narrates a lot of UF, so I’ll definitely have to check his work out!